Caption slip reads: "Photographer: Richardson. Date: 1956-07-13. Reporter: Swaim. Assignment: skunks. Special instructions: South Whittier. 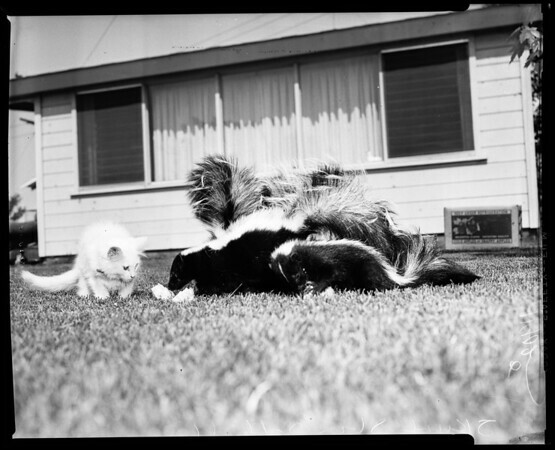 K 21, 22, 26: Four half grown (4 months old) skunks (descented), pets of Charles Garwood, and a fluffy kitten about the same age, nibbles from same corn and apricot snacks on Garwood's front lawn at 11824 Eagan Dr., South Whittier. The skunks were bottle fed for 6 weeks. There were six in the litter, but two are in pet shop window. Garwood, painting contractor, also has monkey, parrot, dog".